Critically-acclaimed bestselling author James Hankins' latest, A Blood Thing, follows a relentless blackmailer who pushes family ties to a sickening breaking point in this how-far-would-you-go thriller. Andrew Kane, Vermont's promising young governor, is at a public meet-and-greet moving through the line shaking hands when something unexpected happens. "He turned and saw the assemblage inching closer, the people jocking politely for better positions." writes Hankins. "He smiled at the folks who, just moments ago, had been grousing. Now they were smiling back and reaching out toward him while maintaining a respectful distance - no doubt due in part to the imposing figure to Andrew's right, Mike Burrows, the square-jawed state trooper acting as Andrew's security detail today. Andrew shook their hands and thanked them for coming, looking into their eyes as he did, one after the other, until their faces blended together. "He was moving down the line, nearing the end of the small crowd, making his way toward his black GMC SUV, when he grasped a man's hand thrust toward him and immediately felt something between their palms. The man withdrew his hand quickly, and Andrew was left holding an object. A small black cell phone. "Faint alarm bells clanged in his head, but he quickly relaxed. Plenty of people wanted to use their phones to have their photos taken with the governor. Usually, they held it themselves while taking a selfie beside Andrew. Or they would give their phones or cameras to their friends or family members. Now and then they even tried to hand them to Andrew's security detail, which never went as they hoped. So, although this man had gone about it in an odd fashion, most likely he simply wanted a picture he could post on his social media site of choice. "Andrew looked more closely at the phone. It was a flip phone. Small, no bigger than his palm. It didn't even seem capable of taking photos. It looked like a throwaway...a burner phone. But what did Andrew know about it? Technology was changing every second. Perhaps this thing was capable of recording in HD and 3D while simultaneously monitoring his blood pressure, issuing stock market advice, and changing the channels on his TV. "The man turned abruptly and hustled away, toward the center of the senior center." Andrew tries to brush off the bizarre interaction, but something is telling him to hold on to that phone. He puts it in his pocket, assures his security detail that everything is fine, and continues chatting with his voters. Things would take a nasty turn just a few hours later when Andrew's brother, Tyler, is taken into police custody for the brutal murder of a young woman. Andrew is frantic, and when the mysterious cell phone rings, he jumps to answer it. A robotic voice calmly explains that Tyler has been inescapably framed, but that the governor can make it all go away by meeting some simple demands. All he'll have to do is compromise everything he stands for and grant a full pardon to a convicted felon. Lacking a better option, Andrew complies. It didn't take long for Andrew to realize he made a terrible mistake bending to the blackmailer's demands. Little does he know that the man behind the robotic voice has a much larger plan in motion than Andrew and his family could have possibly foreseen. The man presents Andrew with another little condition. Then another. And another. Andrew has no choice but to play along until he can find a way out of this personal and political nightmare. As the body count grows, Andrew has no preparation for what he will face, or how far he will have to go to save his brother and keep his family together. 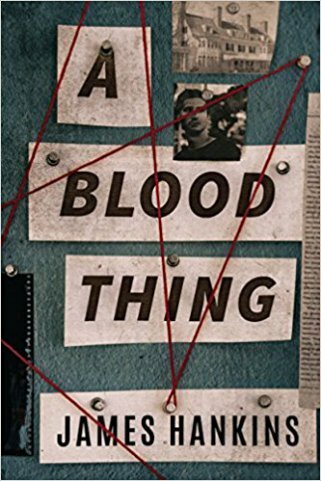 A Blood Thing will keep you on the edge of your seat, as it plunges you into a world of family secrets, cold-blooded murder, and political maneuvering.